Understanding the vegetable nutrient relationship between your vegetables and your soil is an important aspect of organic gardening crop rotation. This relationship of plant and nutrient determines whether you have a successful long term, healthy organic garden, or a short term pest ridden garden. The principle I use to explain this comes from the world renowned biointensive gardener and author John Jeavons and his incredible book How to Grow More Vegetables . This concept is very easy and helps you rotate your crops in a fashion that uses soil's nutrient efficiently. This crop rotation principle is as follows: Follow heavy feeders with heavy givers. 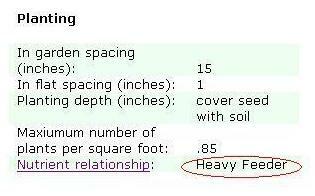 After the heavy givers follow them and plant light feeders or low nitrogen users. In each vegetable "Organic Vegetable Gardening Fact Sheet" I've listed the vegetable nutrient relationship for your crop rotation planning. See example below. These vegetables extract a lot of nutrients from the soil during their growing period. Heavy givers provide you with FREE nitrogen and at the same time provide an edible crop. These plants perform this incredible task by "fixing" nitrogen into the soil with their roots that grow nitrogen nodules. As the roots die (or left in after harvest) this nitrogen is released into the soil. These vegetables use less nutrients than heavy feeders during their growing period. These vegetables are similar in nutrient use to light feeders, but extracts less nitrogen during their growing period. 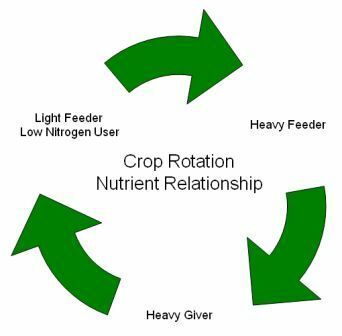 Rotating your crops based on nutrient relationship cycle alone is not enough for complete crop rotation in your organic garden. Compost is a part of crop rotation too. Compost is made up of biologically diverse plant and organic matter, and by its nature is a type of crop rotation. Use compost throughout your garden as part of your crop rotation practice.